Simmons Promotions held their fourth Budweiser Open Shootout of 2002 on Labor Day, Monday, September 2nd at the Davenport Speedway. The event was sponsored by Iowa Illinois Taylor Insulation, John Keady�s Gm Superstore, Auto Acres and Hollywood Graphics. An outstanding field of 48 Bud Late Models and 32 Modifieds were on hand. The 50 lap Budweiser Late Model feature took to the big smooth � mile track with 26 drivers taking the green flag. Ace Ihm led lap number one from the pole position before Ray Guss Jr. was able to take over the top spot. 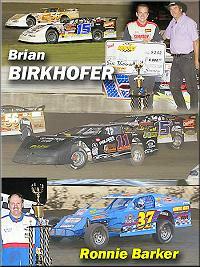 Guss Jr.�s lead was short lived as he was passed by Brian Birkhofer on lap four. Birkhofer went on to turn in a dominating performance. The race was slowed for one minor spin on lap fifteen, on the restart Birkhofer took off led the final 35 laps. Birkhofer was able to put his car anywhere he wanted to on the multi-grooved track and steadily worked through traffic. Birkhofer put the fifth place car of Skip Frey a lap down on lap 48 of the 50 lap feature. Simmons Promotions held four Bud Shootouts in 2002 at the Davenport Speedway and Birkhofer was able to win all four events. Darren Miller took the checkers in second ahead of Guss. Todd Davis and Skip Frey rounded out the top five. Heat winners were Birkhofer, Ihm, Guss Jr. and Rob Toland. The 6 lap Hollywood graphics fast dash win went to Ihm. The Auto Acres ten lap non-qualifiers race turned out be a three wide finish with Brian Harris nipping Tom Cannon and Steve Johnson at the checkers. The Modifieds ran in conjunction with the Bud Late Models on Monday night and the 24 drivers who took the green flag for the feature event are to be commended for putting on an outstanding 20 lap caution free race. The top six in passing points earned in the heats were inverted for the main event. The invert landed Ron Barker on the outside front row of the feature. Barker led the race flag to flag in scoring his 31st win of the 2002 season. Jim Sandusky advanced from his sixth position start to take second ahead of Rob Verbeck.